Building A Beast. 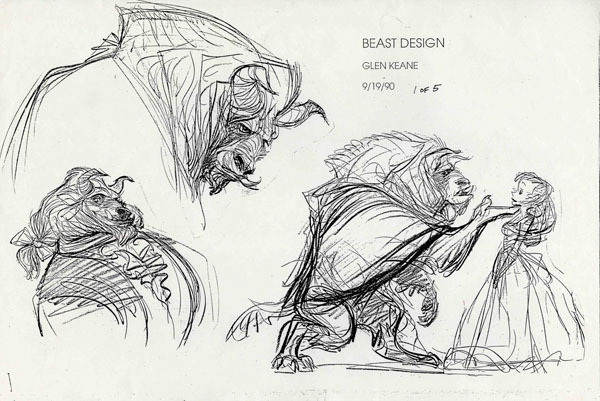 From the New York Times November 17th, 1991, Glen Keane talked about his work on Beast in Disney’s animated feature Beauty and the Beast (1991): “He’s a beast here on earth rather than some bizarre otherworldly creature. I started looking at different animals and taking different elements. Most of the designs in the fairy tale books I looked at were animal heads stuck on human bodies. On the CBS television series (with Ron Perlman in 1987-1990), I saw it once and didn’t like it. To me that beast looked like a guy with a lion’s head. “I started with the heavy brow and skull crest of the gorilla because of massive strength. Then I added the mane of a lion because it was soft and an ideal frame for the head. The general shape of the buffalo’s head had sort of a heaviness that gave it a general sadness I really liked. Keane spent hours watching a variety of animals at the London Zoo. He studied the slow swirl of his arm and the curl of his fingers. He donned a cape and stormed through the converted warehouse that served as home to the film’s animators. He tracked the movement of his lips as he growled, matching his inflection with the soundtrack of Robbie Benson. He studied ballroom dancers and even took a spin around the floor with animator James Baxter who was lead animator for Belle so he could get a realistic feel for the way the characters should move together. “I started out with his main problem, his selfishness,” stated Keane. “He’s a guy who’s extremely self-centered and has an incredible temper. It’d be like you could draw a picture of your emotions when you’re extremely angry. What do we look like? We look like a beast and that’s what happened to Beast and suddenly he looked the way he was inside. “I kept thinking ‘How is it that Belle could fall in love with Beast?’ It felt very unrealistic that she would ever feel for this guy who is keeping her captive. Then he did something that was a really selfless act, the only thing he could do to show his love. He set her free. That’s where it crystallized for me. Don’t Work There. In New York Times Magazine November 23, 1969, producer and writer Bill Scott said, “Hanna-Barbera is an enormously efficient operation that can produce an enormous amount of footage at low cost. I wouldn’t want to work there. Charles Beaumont. Writer Charles Beaumont wrote many “speculative fiction” stories for magazines, books, movies and for the Twilight Zone television series. He was born Charles Leroy Nutt. 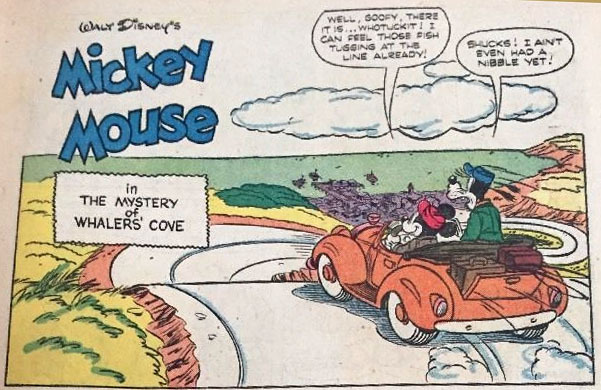 He wrote about two dozen comic books stories for Western Publishing including two Mickey Mouse adventures in collobration with writer William Nolan (The Mystery of the Whaler’s Cove 1955 and The Mystery of Diamond Mountain 1956). Historian and good friend Dana Gabbard located an article written by Beaumont about comic books in the May 1955 issue of Fortnight magazine that is generally considered the first mention of Carl Barks and his work. Here is the link to the nine page article. 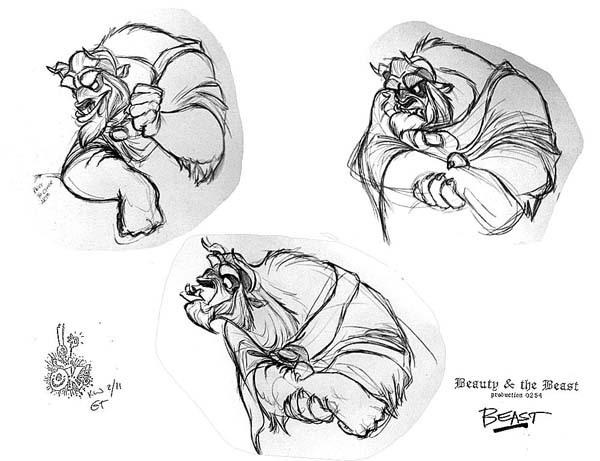 Why this makes it a segment of Animation Anecdotes is that I have uncovered some information that Beaumont apparently may have worked very briefly in MGM animation sometime in his early twenties (which would make it sometime in the early 1950s). I have no more information but am still digging — but by 1954 he was writing for television series and he certainly dabbled in many different fields. My favorite Beaumont Twilight Zone credit will always be “A Nice Place to Visit” (“Heaven? Whatever gave you the idea you were in Heaven, Mr. Valentine? This is the other place!”).. Despite the fact that I like the work of both Hanna-Barbera Studios and Jay Ward Studios, my love and respect will always go out to Jay Ward Studios for exactly the reasons Bill Scott and Jay Ward himself give within these anecdotes. I was revisiting RUFF AND REDDY recently and, while I liked some of the adventures, cost-cutting could be felt throughout. When Bill Scott lumps Hanna-Barbera and Termite Terrace in one “category”, I have to respectfully disagree. He is right in saying that, when animation is limited, the cartoon has to be “fat” in some capacity, and there were times where the weight there was in the magnificence of Carl Stalling’s score which is often so interesting to listen to while the action continues even at its most predictable. Jay Ward knew how to use limited animation in such a way as to move the story along. 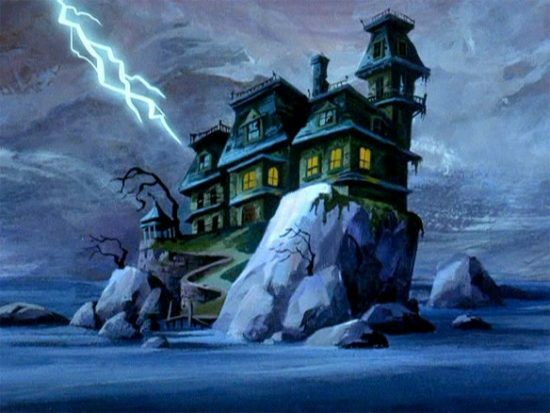 I just wish that the animation were done entirely in this country, because Jay Ward animation never looked as good as when seen throughout the “GEORGE OF THE JUNGLE” show, where they were working in a show format that was as close to Hanna-Barbera as Ward cartoons ever got, and the material still was so much better! By the way, though, although it might sound to some as if I am shunning “RUFF AND REDDY”, I would love to get a restored DVD set around the show. I realize that, to some, this stuff is good in smaller doses, but it is still interesting to see the duo’s first foray into simpler animation specifically for television…and you can see that they were learning as they went along…and the scripts got better once HUCKLEBERRY HOUND and QUICK DRAW MCGRAW were created. They made a brief cameo in the 1972 “Yogi’s Ark Lark” special which was the pilot for the infamous “Yogi’s Gang” series (which the two did not appear). As for the gritty comic book, why is DC doing this to the Hanna-Barbera and Looney Tunes characters? I really think Dan “Devil” should step down for this and other things. …Thank you, Nic. I knew that R&R had made slight appearance in other H-B work post- the series and phrased what I wrote reflecting this – Generally, so, why was the original series and the characters left so in obscurity, again, throughout the Sixties on?